Yosemite is one of those places that should be on your bucket list. Might as well add Yellowstone too. 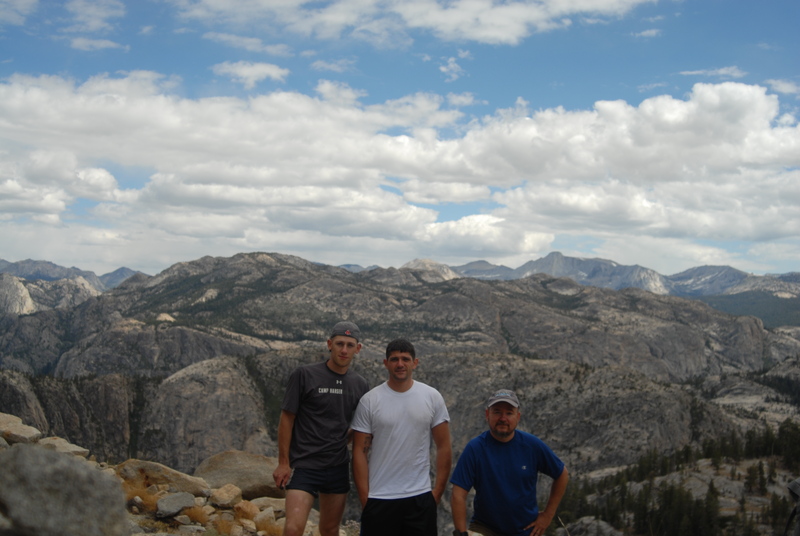 This would be our first trip to the Sierras with a week full of day hikes. The previous year we went to Sequoia National Park for a few days. This area was unlike any other and we were in awe of the mammoth trees. The trip up from San Diego through the Central Valley revealed one of the breadbaskets of this state. The rich, flat land on the western side of the Sierras is not quite as scenic as the eastern side, but still a welcome change from the drive through LA. Not yet campers, we chose to stay outside the south entrance of the park in Oakhurst, a small mountain town. 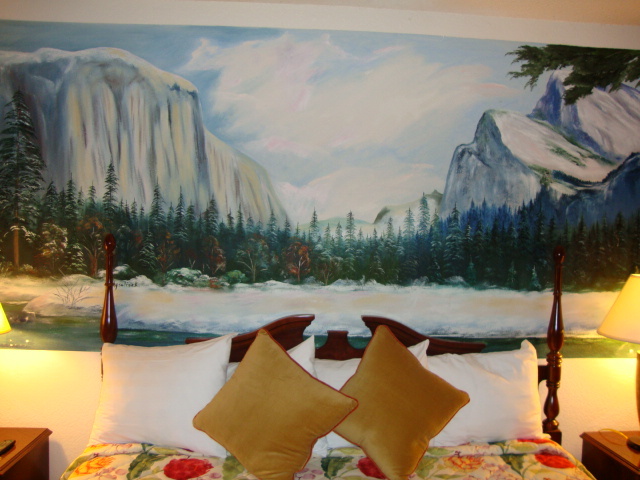 The hotel was a quaint Best Western, complete with an in room mural of the most recognized views in the park. Tacky, but cool because someone took the time to paint it. We mapped out a few day hikes ahead of time ranging from 5-10 miles per day. Each day, we planned to head deeper into the park over the curvy, meandering state road 41 that passed through Yosemite. 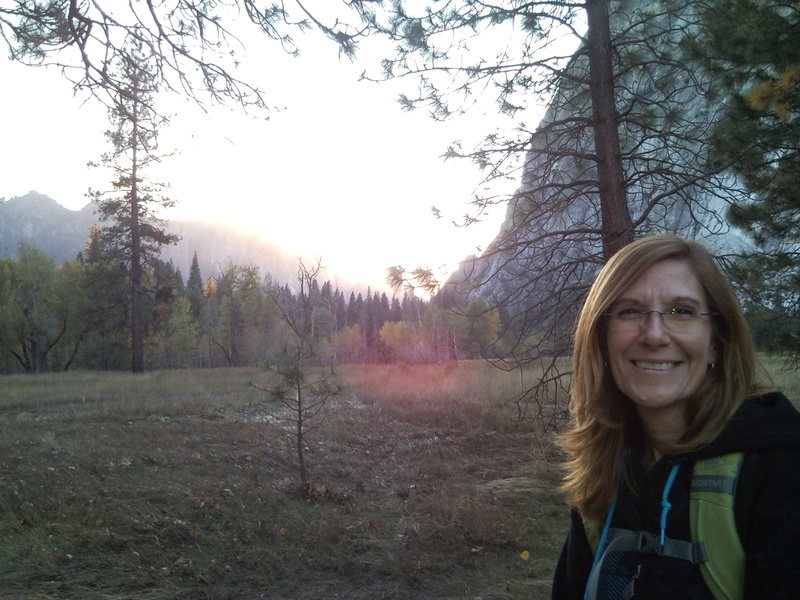 Our first hike would take us to the Four Mile Trail, a moderate hike from the Yosemite Valley floor to Glacier Point, with some of the best views in the park. Starting out near the visitor center, we would park and catch the shuttle to within a half mile of the trailhead. It was a brisk morning, in the low 40s. The Merced River was lazily winding its way through the valley, the current fairly slow this time of the year. We crossed over Swinging Bridge and began a casual stroll to the trailhead. Timber is abundant throughout this trail and it takes awhile for the scenery to open up. The first view of upper Yosemite Falls was excellent. Normally fairly dormant in the fall, a recent rainstorm produced decent flows. It didn’t take long to encounter our first critters of the day, a couple of deer munching on the flora. They almost ignored us as we made our way up the switchback. In the summer, I’ve read that this is a crowded trail. With the kids in school, we didn’t see many people today. There seemed to be quite a few “blowdowns” on the way up, each a photo op as we scrambled over them. To the west, we could see Cathedral Rocks and the other side of El Capitan. As the switchbacks headed east, we would receive a stiff, cool breeze. On the westbound trek, it would get hot from the exertion. We would peel layers off and put them back on all morning. 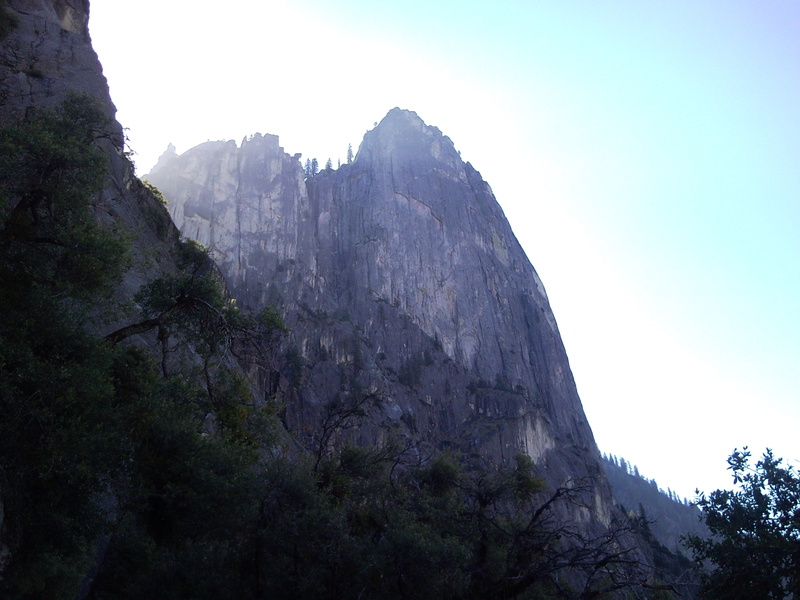 Passing Sentinel Rock, I thought about how great the view must be from up there. Approaching 5,000 ft, the number of switchbacks increased as the altitude increased more rapidly. The trees started to thin out and became larger. What is really impressive about this trail is each turn reveals a new angle on the amazing scenery. It is difficult not to stop and take pictures every 5 minutes. Half Dome came into view and the trail became narrow as we would wind around the trees. I can see why they close this in the winter, some spots if covered with snow or ice would be fairly treacherous. Nearing 7,000 ft. walking around the Ponderosa Pines, we felt pretty small. Breaking out of the woods, we came out at Glacier Point, a popular destination with an awesome panorama. At this point, we were just like any other tourist and took lots of pictures. The views to the west of Vernal and Nevada Falls, Half Dome, Liberty Cap, and the valley below were enjoyable. We refilled our water and started the 4.7 miles back down. Weird, the constant downhill made my boots feel small. As a novice hiker, I didn’t realize that your feet swell the longer you are on the trail. My toes starting banging against the front of the toebox. What should have been an easy trip down, became a painful experience. On top of that, an old knee injury reminded me that it was still there. 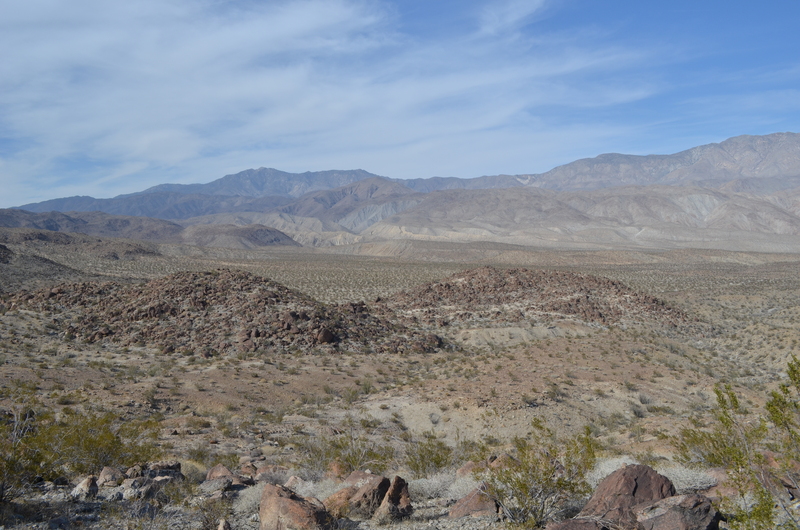 Before we leveled out in the valley, I was sidestepping my way down, looking like a landlocked crab. Within a week, both of my big toenails were a shade of dark blue and would hang on for another six months before falling off. By the time we reached the car, we had hiked over 10 miles and 6,400 ft. of elevation change. All in all, a good way to start our Yosemite adventure. Lessons Learned: 1. Get hiking shoes at least one size larger. 2. Use two hiking poles, it makes it easier on the knees going downhill. 3. Fall is a great time to escape the crowds in Yosemite. Naturalist John Muir wrote of San Jacinto Peak, “The view from San Jacinto is the most sublime spectacle to be found anywhere on this earth! Well, if good ol’ John said that, then it must be true. Our trek would take us up to a peak that was over two miles high. The air would be noticeably thinner as we pushed toward the summit. We weren’t sure what the weather would be like near the top. 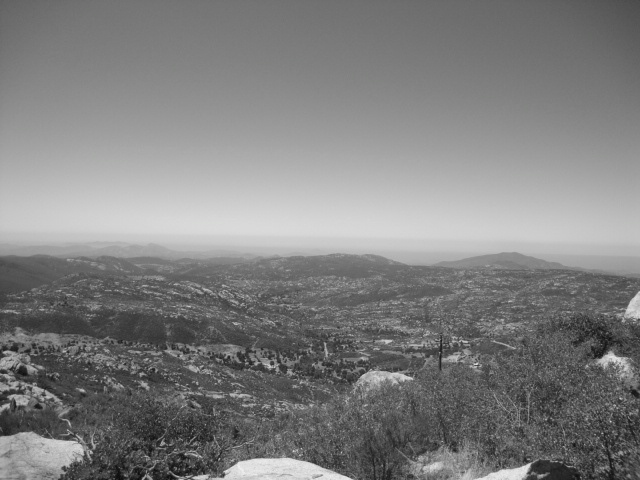 Many of the areas we hike in San Diego County are over 5,000 ft. with cool breezes. 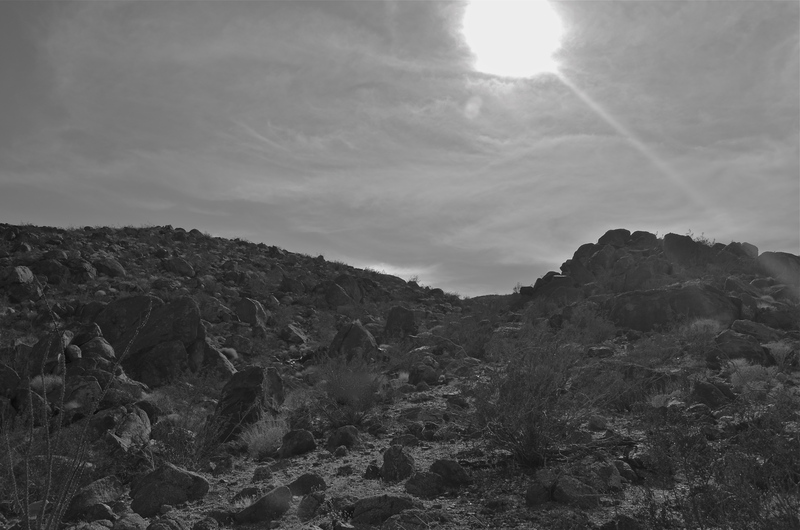 A previous hike took us into the San Jacinto Wilderness, with impressive rolling hills, an abundance of tall pines and granite monoliths that are a rock climber’s Valhalla. The easiest way to hike Mt. 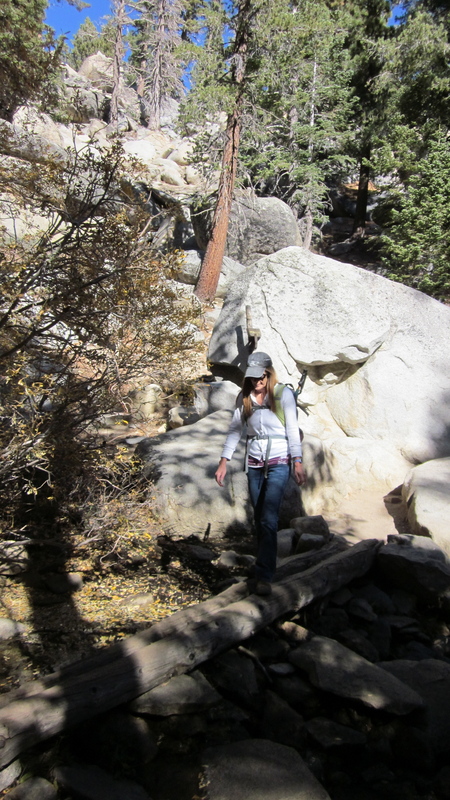 San Jacinto as a day hike was to catch the aerial tramway in Palm Springs. It promised to ascend from near the desert floor to 8,000 ft., passing from the desert to the alpine forest. 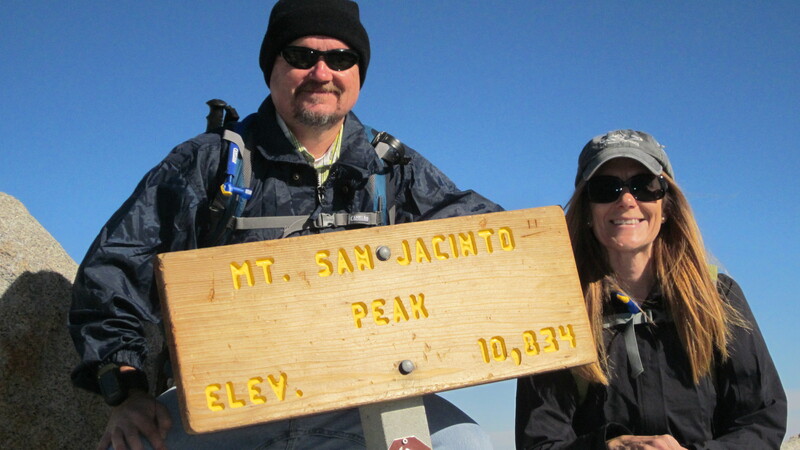 From there, we could do a 12 mile round trip hike to the peak which topped out at 10,834. 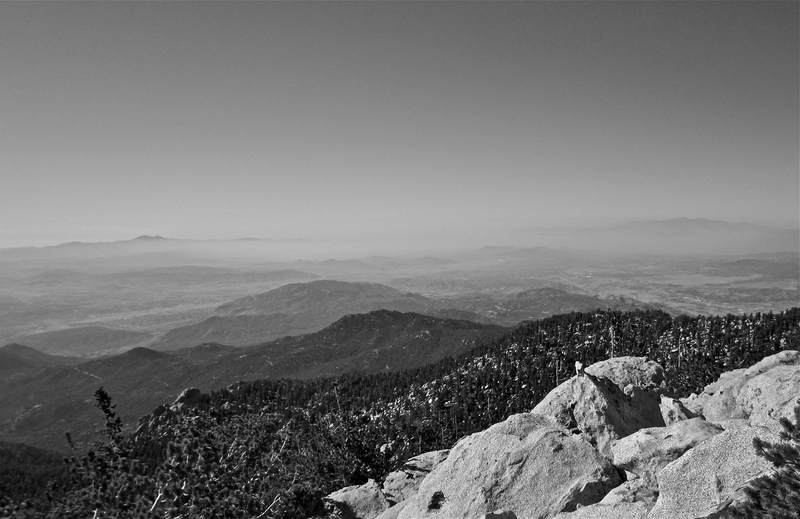 It is the second highest peak in southern California with Mt Gorgonio nearby at 11,000+. 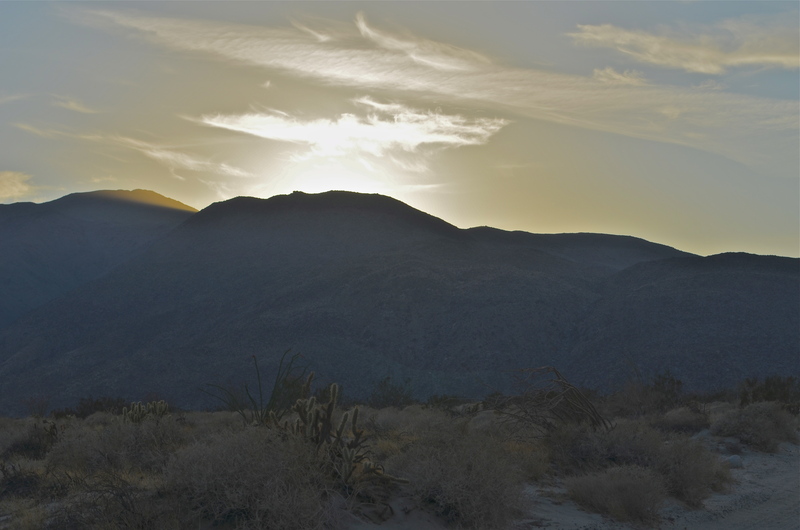 Driving in to Palm Springs, we would actually make our way around the mountain with its’ steep north face. 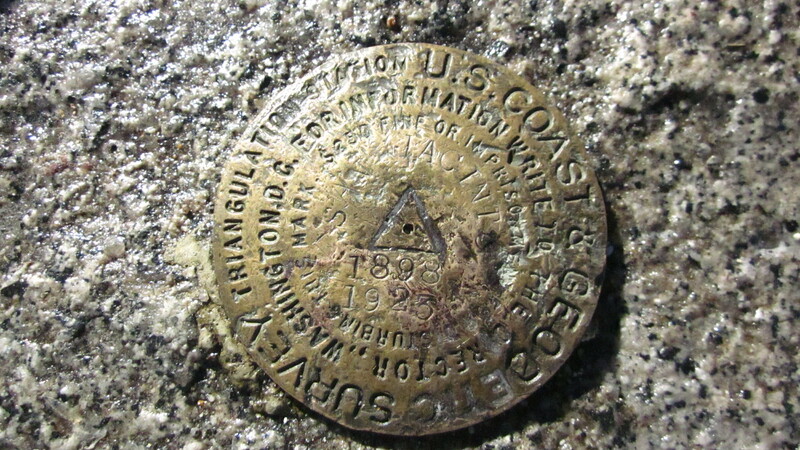 Afterwards, I read that this mountain is ranked 6th in prominence in the lower 48 states. Basically, the peak increases in height rapidly in a relatively short distance. The tram ride up was pretty cool. 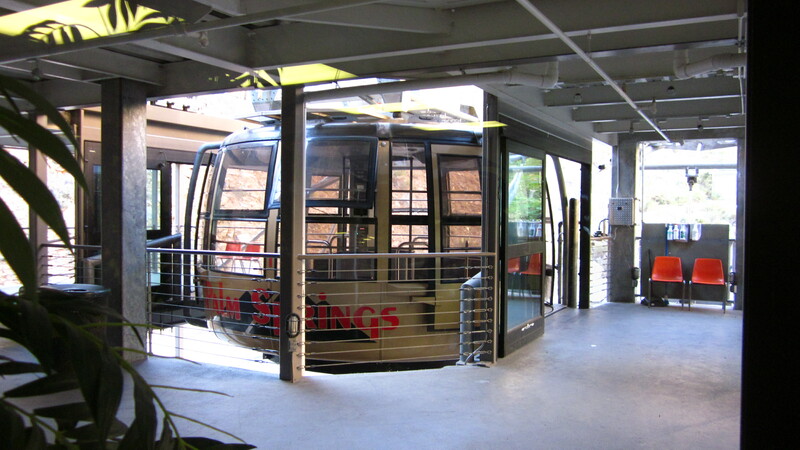 The cable car was a large round vehicle, could hold over 60 people and is the largest of its’ kind in the world. Since this was during the week, there weren’t many people heading up mid-morning. The views were amazing as we made the 6,000 ft. climb, the car turning slowly as it rose. As the car passed each supporting tower, it would drop and give you a momentary sinking feeling. This was going to be neat when we return at night. The visitor center at the top was nice, with restaurants and gift shop, but that was for the tourists. We were here to hike so we made our way to the ranger station, got our permit and headed out. The path was easy to follow, very sandy and the landscape was a mix of deciduous and conifer trees. We crossed a creek and the trail began a steady incline through a heavily wooded area. The Jeffrey and tall Sugar pines gave way to the Lodgepole pines as we gained altitude. The variety of plants and trees up here was interesting. The White-headed woodpeckers were very chatty, seemingly fussing at each other. Often, you will see an entire family climbing close to each other. A trail runner and older female hiker passed us as we hit the steep switchbacks. You know, I was feeling quite proud of myself until then. When you see someone running past you – uphill, it just humbles you. We made our way to Wellman’s Divide and the trail split two or three ways. The views at the divide were glorious. The woman who passed us earlier was friendly and took our pictures before she continued to the summit. We caught our breath and at 9,400 ft headed up the “hill” Slowing frequently to take photos, I pushed to keep up with my amazing wife who was about 150 ft. ahead. Nearing 10,000 ft, we stopped to take a photo of the altitude and coordinates of the GPS where I would later post it on Facebook for my friend John to figure out where we where. It’s a game we play, he looks up the UTM coordinates and pinpoints where we are. It was actually fairly warm up here and the thin, dry air made a solid workout even more challenging. Mary slowed down as the possible effects of altitude sickness started . After a snack and water, she felt better and we continued on. Did I mention before that she was tough? Close to the summit, we found a cabin build for stranded hikers. Often, the weather changes quickly and this structure has saved more than a few lives. A few more photos and as we made our way to the top, the trail seemingly ended. All that was in front of us were big boulders and trees. The rocks were higher than us, so we climbed over and around, finally emerging at the peak. There it was, the sign at the top. The lady hiker we met earlier took our photo again. Most people on the backcountry trails are very nice and love to help others out with information. Often, complete strangers share their food with the thru-hikers on their long hikes. The views at the top were just as John Muir said – “sublime”. We had our lunch, made a silly video pretending that we were lost and enjoyed the crisp, clear air. Palm Springs was over 2 miles below, Mt. Gregorio to our east and the rest of Riverside County to the west. It was getting late, so we started our way down. We were making good time, probably 4-5 miles an hour and the shadows were getting long. Because the air was so dry and breathing through your mouth causes a lot of moisture loss, I ran out of water about an hour from the end. Mary, shared hers with me as we stopped by some outhouses in the middle of the woods. The outhouses were BYOTP. Enjoy life friends, God has given you another day! Honey, You Missed the Turnoff…. Part of the thrill in hiking is finding a new trail or one that is lightly travelled. To do so, you have to get away from the hustle and bustle of the big city. There are many trails within thirty minutes of our home in north San Diego (SD) County. Usually, the locals with their dogs or trail runners hit those on the weekends. Often, I will drive 60 or 70 miles to find a remote trail. East SD county offers some of the best areas if you want to leave the crowds behind. So began one of our weekend hikes. Before leaving home, I planned our route to Oakzanita Peak, a fairly diverse trail to a summit with decent views to the east. 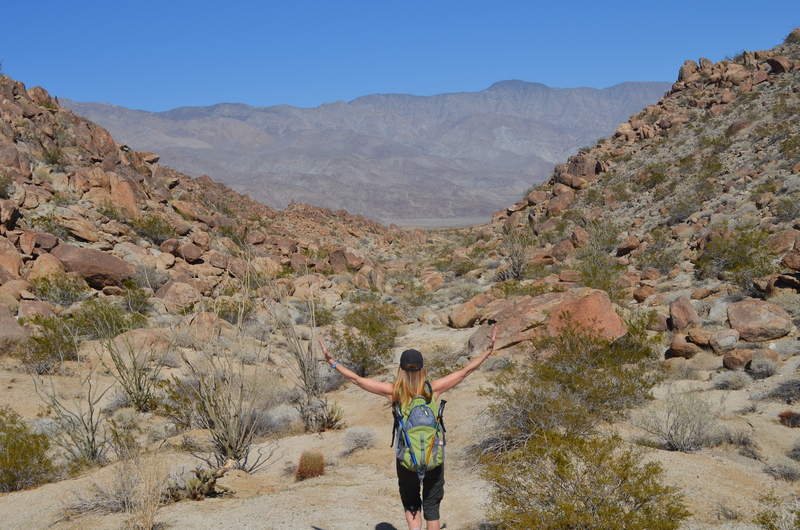 Our typical weekend hikes are between 5-7 miles and a good amount of elevation change. I like the scenery and Mary sees it as a workout. For mid August it would be a warm day, but I reasoned we would get a decent breeze at 5,000 ft.
At the southern edge of Cuyamaca State Park and bordering the Cleveland National Forest, Oakzanita Peak gets its name from the oak trees and manzanita bushes. The manzanita is a strange bush/small tree with a beautiful red bark and is quite at home within the chaparral community. Sometimes the bushes have berries or little fruit that looks like apples – hence the spanish name manzana. At the trailhead, the usual routine is to get out the sunscreen, GPS, backpack, my stinger, and the maps. Uh-oh, no maps. Left them on the dining room table. No problem, I have a basic GPS, will just mark a waypoint at the beginning of the trail. The hike up to the peak took us down into a creek, up a fire road and into the chaparral. It was a moderate workout, mainly due to the heat which was somewhere around 80 deg. 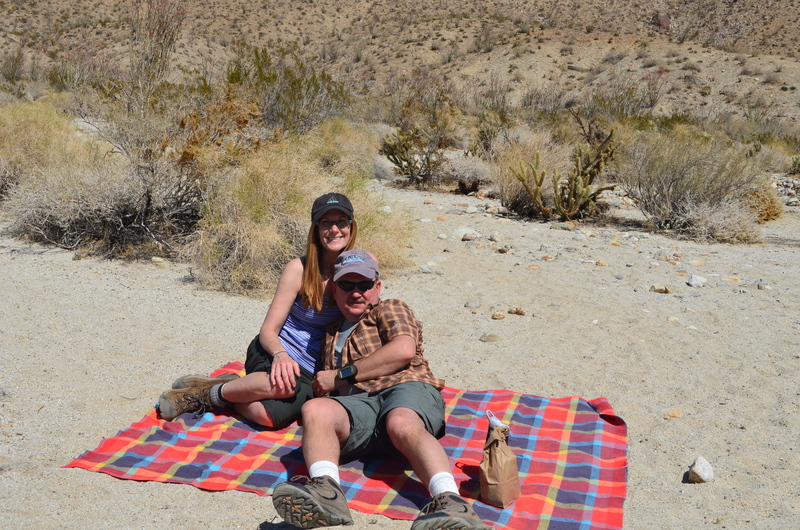 At the top, there was another couple but we found a secluded outcropping and enjoyed the vista while we ate our lunch. Afterwards, I told Mary that we could go north, intersect another trail and head west toward the car. We crossed a fire road and ended up in a meadow where large birds were circling nearby. 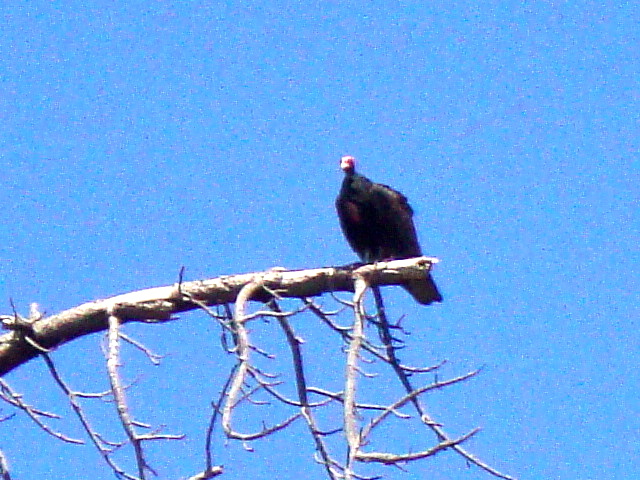 At first, we thought they were California Condors like we’ve seen at the Wild Animal Park. After we got home, we researched a bit and surmised that they were probably young turkey buzzards. A pair of them were in a dead tree to our left. They observed us we walked past, and I couldn’t help to think that they probably wished we would pass out or drop dead so that they could feast on us. We were impressed with their wingspan and their ability to effortlessly float on the afternoon wind currents. Farther to the east, we could see several more performing lazy circles over the arid landscape. Some organization, perhaps the Forestry Service had planted conifers throughout the fields here and provided little shields to shade them from the harsh sun. It was cool to see new life where there was so much destruction. After another mile or so, the landscape opened up. Rolling hills with prairie grass surrounded us. The path arced its way around the plain. We could imagine herds of deer roaming this area but it was late in the afternoon, so it was just the two of us. The breeze while hot, made the tall grass wave and beckoned us to head west. After a few minutes, we noticed movement around our feet. Hundreds, no thousands of grasshoppers would scatter as we walked along the path. It was weird, like a mini-plague. After a couple of miles in the rolling meadows, we began to enter a wooded area and noticed movement to our left. A family of wild turkeys observed us as we strolled by. I thought about the time in Pennsylvania when a wild turkey attacked our minivan while driving down a country road. Back then, this bold bird pecked our tires while we laughed. Today, I was hoping that these birds would choose to keep their distance. They gave us the evil eye, but “allowed” us to pass. At this point, we felt out of it. Although we were well hydrated and had eaten, the physical exertion and heat must have affected our electrolytes. We continued to move west, hoping to see a recognizable trail marker indicating that we were close to the road. The path turned into a narrow rutted dry stream or creek bed and became very rocky. Mary, who is usually in the front stumbled and kept moving. Passing a trail to the north, I knew that eventually we would have to head south. After another 15 minutes, I was relieved when I noticed a trail that broke off to the left. “Honey, you missed the turnoff”, I said to Mary who was still heading straight. She was on autopilot and had zipped right by the path. The new trail was a narrow rut just wide enough for your feet and dropped down through a thick forest. We noticed some deer moving around and realized that it was getting late and more critters would be out soon. Crossing a creek, I was intrigued at hundreds of bees that were hanging around the water. They ignored us as we picked our way over the rocks. Later, researching this phenomenon, I would learn that these bees were gathering water. They would spray it around the queen and rapidly fan their wings to cool her. And we thought mankind invented air conditioning. After the 10 mile mark, we emerged on a fire road and eventually recognized the original trail off to the left. Today’s unmapped trek took us on a wide loop through some of the most remote areas ever. 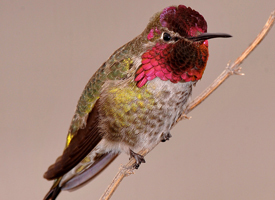 The abundant wildlife was encouraging in an area so ravaged by fire only 4 years ago. By the time we got back to the car, we were spent. Thankfully we didn’t pass out, but learned a valuable lesson on keeping your energy levels up and electrolytes in balance. Oh yes, and next time don’t forget the maps. The last series of blogs journaled a trip from last year that helped me realize we often set limits on what we can do. Thinking back, there were several times that I wanted to shoot up the red star cluster and give up. The reward for persevering was scenery that will never be forgotten, camaraderie with others and an appreciation for our natural parks. The 5 day trip raised the bar for me as far as physical challenges. Too frequently, we get caught up in the rat race, you know the requirement to put food on the table and survive. Backpacking has become a release. A release in the sense that the cares of the world seem far away when you are miles away from the nearest road. Understand, as a believer in Christ, I have a firm foundation on where my hope is. It is not in our government, nor any other person, place or thing. My hope rests in Him and what He has done for us. The salvation offered through grace, is all-sufficient. Backcountry hiking for me is an opportunity to reflect and appreciate the majesty of his creation. There is something neat about carrying everything that you need to survive on your back. 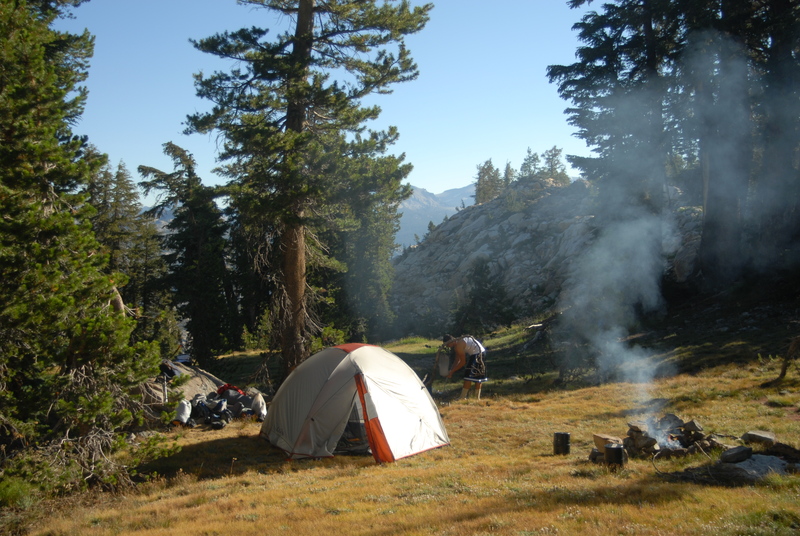 Others, the minimalist backpackers, learn to survive with even less stuff. It makes sense after I carried an extra 15 pounds all week. I noticed that once you get home after spending a week on the trail it becomes apparent how much stuff you have. Needless stuff in boxes or in closets. Things that you haven’t worn in a year or junk that takes up space. The gypsies of old had it right. Take what you can carry. It doesn’t matter where you live. We just happen to live in an area where it is easy to get out and experience the adventure. Just ask my family, wherever we have lived or traveled – we have gotten out. From the beaches in Nags Head, NC to Mount Rushmore, the Grand Canyon or a huge boulder field in the Lehigh Valley, Pa. Whether it’s the Appalachian Trail, the Pacific Crest Trail, or the Rockies – just go. I need to spend more time in the backcountry. Maybe it will help me get rid of stuff. 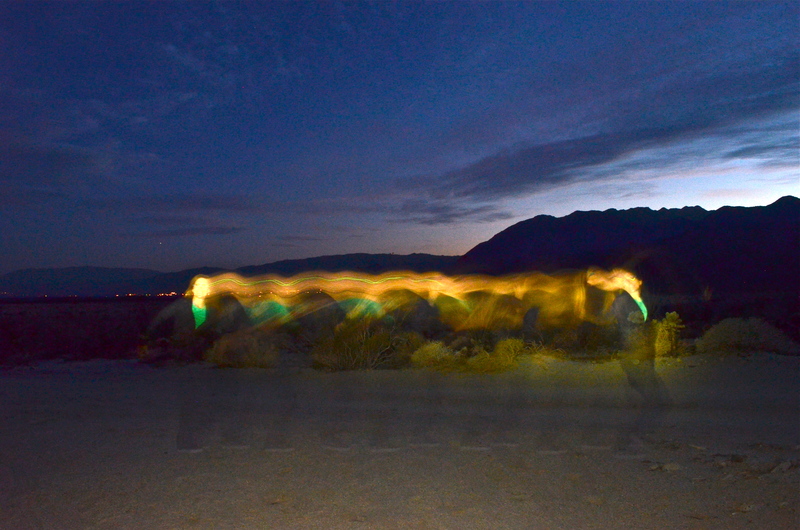 Hoofing up the Tioga Road. Waking up the next morning it was good to see that the gophers did not have their way with our backpacks. Surprisingly, we didn’t have any problems with vermin getting into our stuff all week. normally, you hear about bears or some other critter ripping through or stealing your stuff. One ranger told us to wedge our bearcans between rocks so that the bears wouldn’t roll them down the hill and off a cliff to crack open the contents. Here again, my imagination took off and I could see Yogi and BooBoo walking upright, carrying our food away during the night. We were to learn later that some people put reflective tape on their bearcans to find them in the dark after the bears moved them. After the standard breakfast of oatmeal, energy bar, coffee I searched out today’s spot for the loo. Usually, I would look for a large tree or collection of rocks to hide behind. I can only imagine how embarrassing it would be if you picked a spot that just happened to be in plain view of a trail. Well, maybe not. Since everyone else this far out experiences the same challenges, you probably wouldn’t give it much thought. 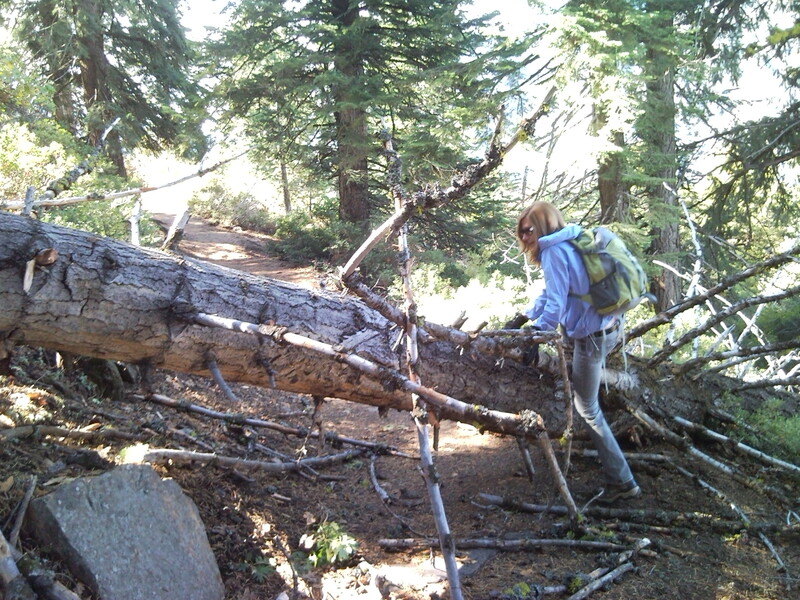 I found a fallen tree with soft ground – perfect. What would I do if a rattler came up on me? Naaah! By the end of this trip, we all became proficient at digging catholes. Cathole- google that one…..
Today would be our last day of hiking and it would be mostly downhill. Our 5 day route took us in a roughly inverted U shape route where we would come out near Tenaya Lake, about 10 miles east from where the car was. 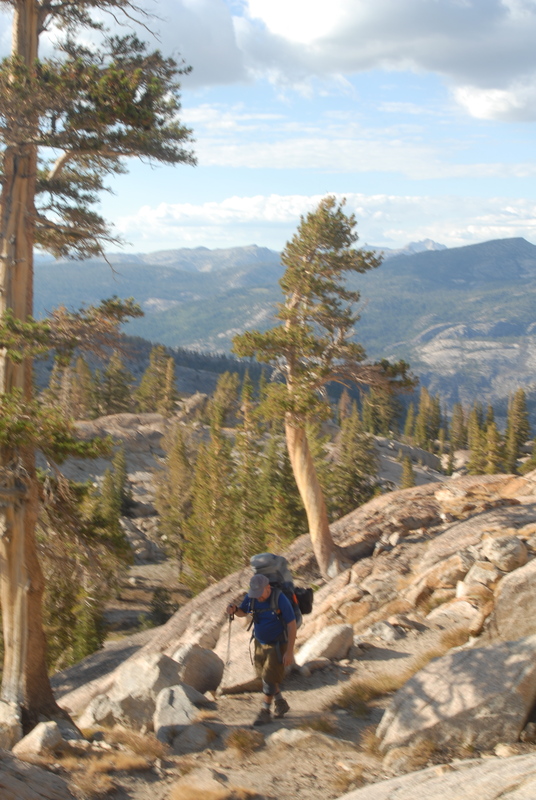 We had a schedule for the hiker’s shuttle which made only one daily run the Tioga Road and into the Yosemite Valley. We only had about 7-8 miles to go, so we could easily make the shuttle. The descent was steady with a few switchbacks and passed through mostly forested areas. At times, the trail would be lined with ferns and wild lilies. 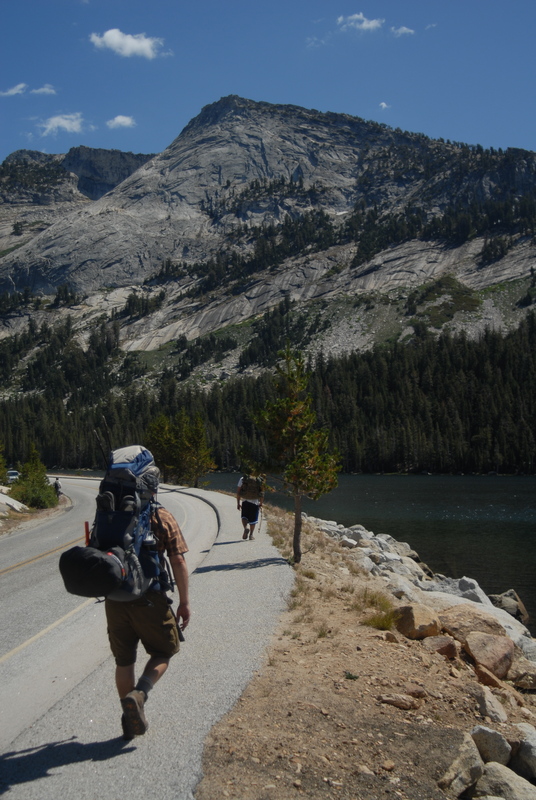 Nearing Tenaya Lake, the day hikers were heading to their destinations like they were on a Sunday stroll. I felt like a pro with my 35 lb pack and 5 days of trail dust on me. of course, the previous week I was one of those daytrippers. 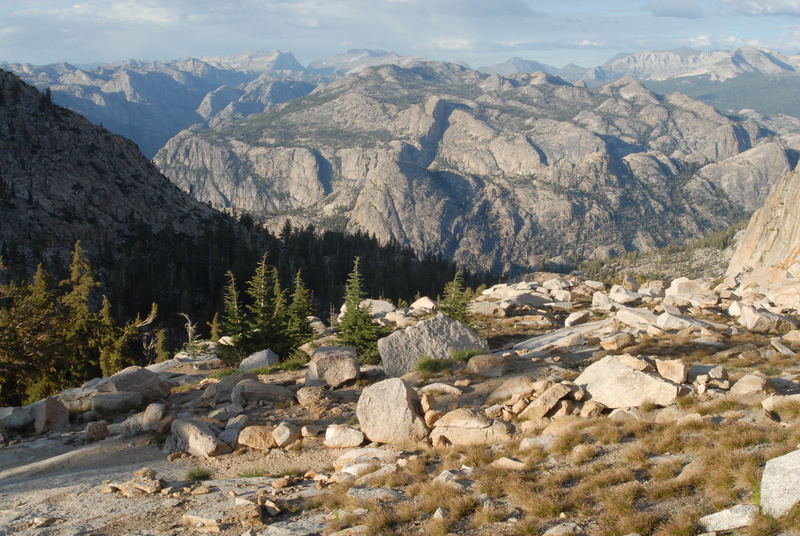 We crossed vast slabs of granite which were outlined with cairns (piles of rocks). To think that someone took the time to mark the trail this way – how nice. We came out on Tioga Road and made our way to the nearest shuttle stop. 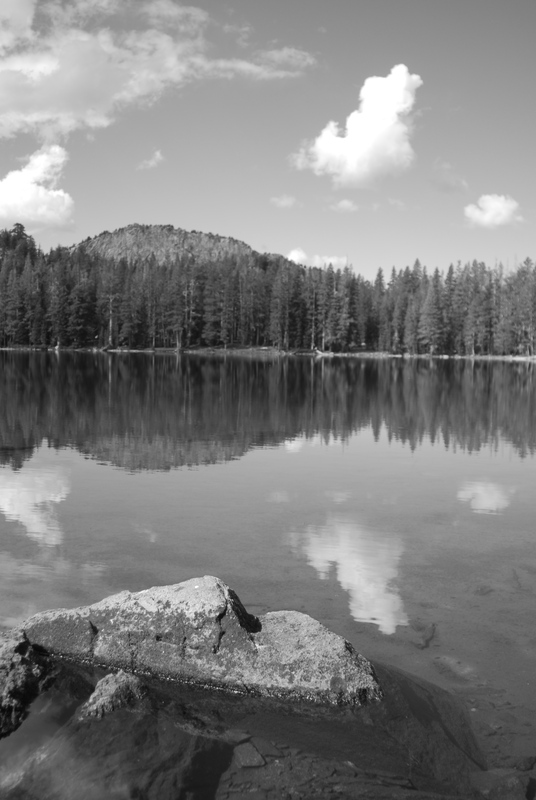 There is a series of shuttle stops during the summer between Tuolumne Visitor Center and Olmstead Point. We asked the driver if she could take us where the hiker shuttle would stop and away we went. The riders on the shuttle seemed squeaky clean in their sneakers and shorts. We probably looked and smelled like homeless people. We got off the shuttle at Olmstead and waited for the bus. We went out on the point and got a great view of Clouds Rest, one of the higher summits in the park. We had lunch and went back to the road where the hiker bus later zoomed past without slowing down. The shuttle driver had given us bum gouge, the bus does not stop here. With the only bus of the day gone, we began a 10 mile walk toward the car along the Tioga Road. Oh well, this was the only mishap of the trip. It was a warm day, like 75-80 degrees and the walk along the road with its steep inclines was tough. After a few miles, we found a pond, refilled our water and rested. Hiking another 7 miles, while possible was not going to be easy on top of the mileage we had walked today. The road had narrow shoulders, curves and was really not safe for pedestrians. Hitching back to the car was tough since there were three of us and no place for cars to pull over. Then Joe came up with the best idea ever. “I’ll run get the car” he says. I’m like ok, you crazy Marine, you do that. Sure enough, he grabs his Nalgene and starts running west on the Tioga Road. He was my hero. I went back to the area near the pond, pulled out my sleeping pad and proceeded to take a nap on a bolder. This was fine until something woke me up, a weird tickle. I sat up and brushed off a strange millipede-praying mantis-ant looking thing. It was hard to take a nap with critters like that crawling around, so I packed my stuff and headed up to the parking lot to await our ride. After a couple of hours, we were starting to wonder where Joe was. 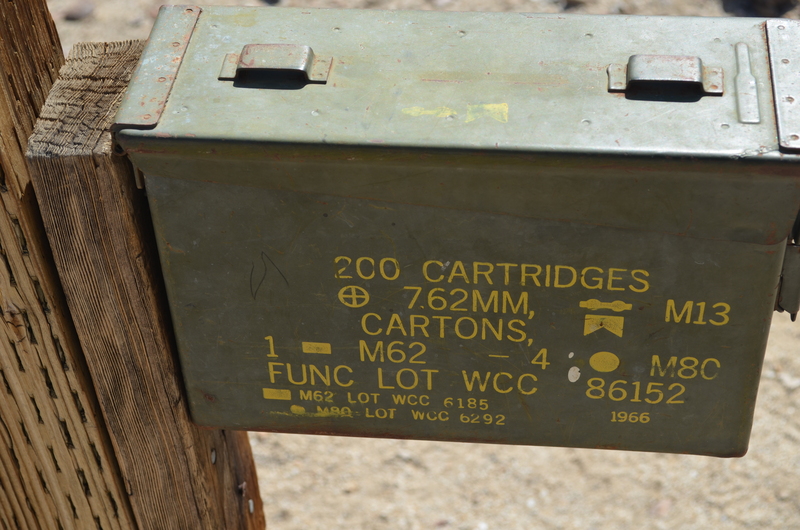 After all, a 7 mile run on the Tioga Road should only take a Marine like – what – one hour? He did show up about an hour later and admitted that the hills did him in. We looked for one last campground on the map and found one about a mile off the road. Yes, we hiked another mile so that we could camp and have a fire. I was halfway joking when I offered to buy a hotel room for the night. The thought of a hot shower and real bed was heavenly. We found a relatively flat area a hundred yards or so from a creek and settled in. The pork-n-beans cooked in the can were the best ever. I remember turning in early and hearing the guys get spooked by a deer that decided to walk through the middle of our camp while they were sitting around the fire. The last day, we drove down into Yosemite Valley and turned our bearcans in at the ranger station. It was strange to be around so many people. After only 5 days of being away from civilization, you start to change. I think that it’s because you adapt to the environment. No cars or modern conveniences, and lots of peace and quiet. No, I’m not a tree hugger, but do have an appreciation for the amazing beauty. I honestly believe that the Lord created places like this for us to enjoy. We must be good stewards and protect these parks. I believe the Sierras are like no other place on earth. John Muir said it best: ” The mountains are calling and I must go.” This is an amazing place that forever has a place in my heart. The constant attack of the mosquitoes convinced us to move on quickly. We found the trail and began our walkabout through a lush forest with tall pines and strange foliage that I’ve never seen before. The deer watched us from a distance, leery of our presence. Often, we would only see the white bushy tail of one in retreat. 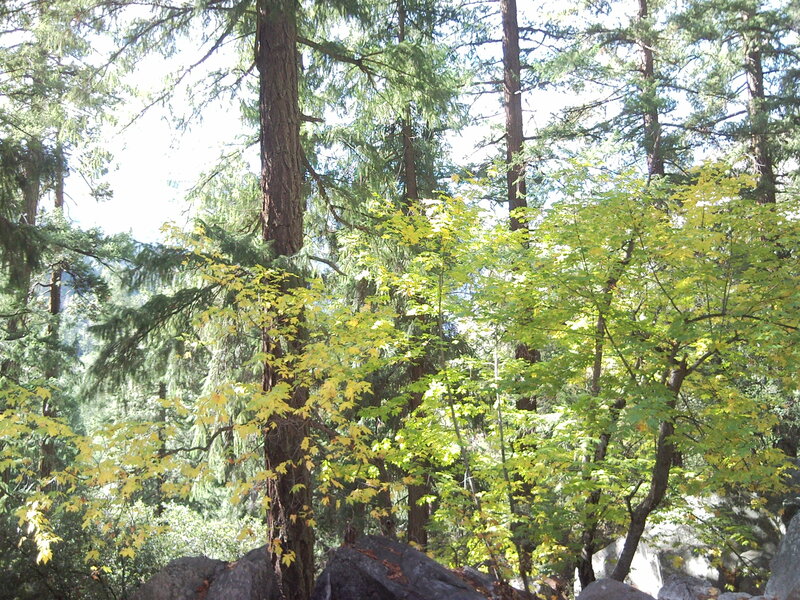 We would emerge from the forest and begin the real descent to the Tuolumne River below. The steep switchbacks consisted of boulders and scree that moved beneath your feet and the hiking poles came in very handy. In places, a slip would result in a fatal drop. Of course I didn’t tell Mary this. By the end of the day, we would experience over 4,000 ft of elevation change. As we made our way down, I looked at the path that the trail followed on the map and noticed the steep ascent on the other side of the river. The terrain flattened out in the valley, at this point we had done over 7 miles and I was feeling it. The bouldering to get down to the last lake drained my energy like an old rechargeable battery. We stopped by the river for lunch. Hmm, what to eat today? Tuna? It was good to eat something, but an IV drip of 5% glucose probably would have been better. The next couple of hours consisted of steep switchbacks up to the Tuolumne Pass. The views at the top were probably the best yet. 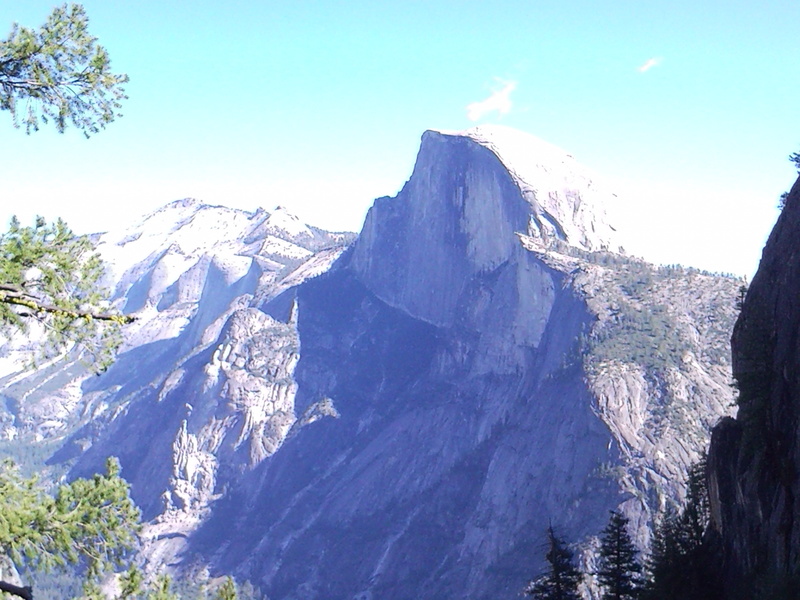 That’s the neat thing about Yosemite, the next view always seems to be more scenic. The guys were patient with me as I trudged up the trail. 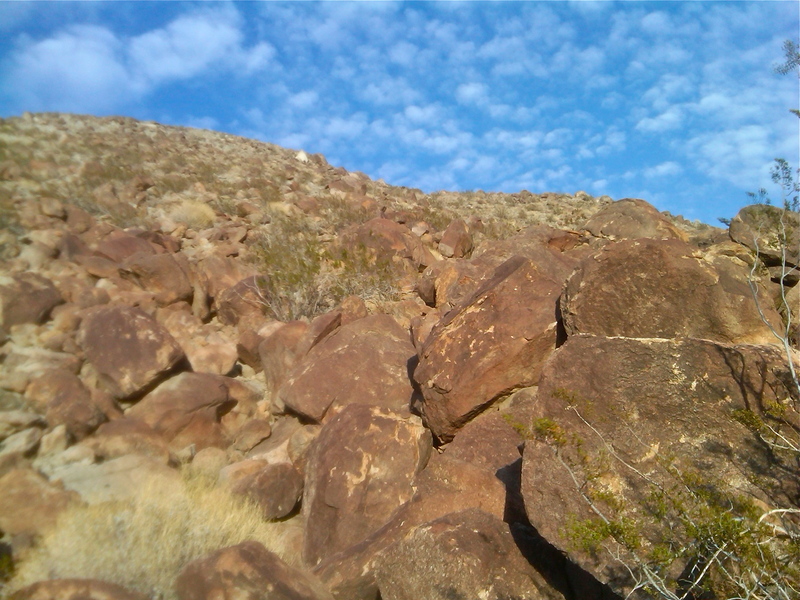 At times, the trail consisted of large rocks or small boulders that you picked your way over or around. Hoping for level ground, we seemed to hit it around 10,000 ft. This is where we would also see the only other person today. This guy had already hiked 12 miles and had another 7-8 to go. Something else happened up here that was cool-cell phone reception. Not sure how, I just know we had it because my phone started beeping. Thinking that it was powered off, it must have gotten turned on by the jostling in my pack. I was able to send/receive a few messages to Mary before losing reception. God is good, he allowed the three of us to call or text our loved ones. After 3-4 days, it was a luxury of sorts. We came upon a fat furry creature, half beaver, half rodent and it seemed to ignore us. Wanting to get a closer look, I was reminded of the scene in the movie “Elf” where the raccoon hissed at Buddy and jumped on his face. I think it was a marmot and am not sure what they eat, but it was plump. Although tired, the terrain was too high for us to establish a campsite. We had to get down below 9,600 ft. We would also be running low on water, so we needed to find some before it got dark. 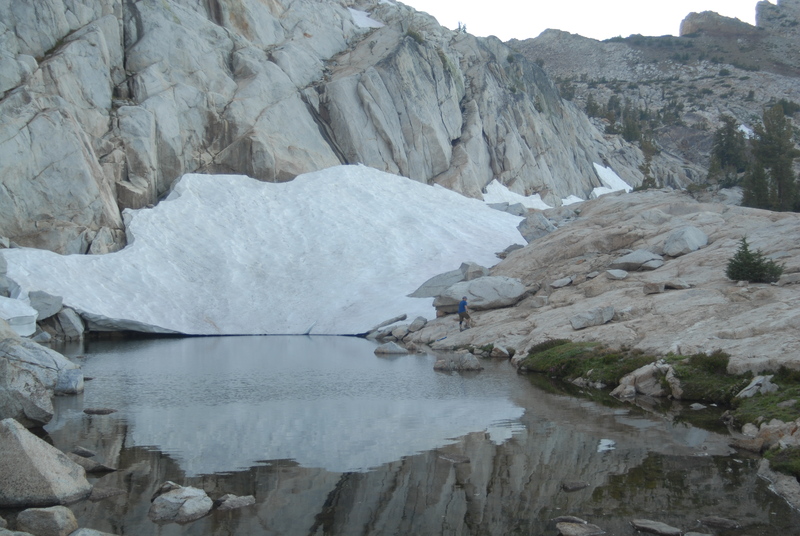 As we entered the pass, we saw a large pond with a snow pack on the other end. I got out the water filter and raced over. It was disappointing; the water was kind of stagnant and had lots of algae. I kept moving closer to the snow until I was almost on top of it. Hopefully, the water filter could take care of any microbes in this pond. It was getting noticeably colder up here and we were losing daylight fast. We needed to descend and find a campsite before dark. 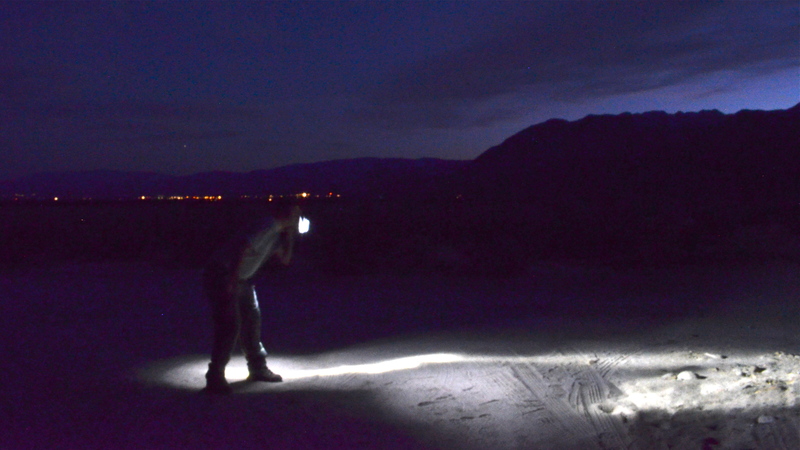 It’s no fun trying to find a campsite in the dark. The one thing about being in the backcountry is that even when it starts to get dark, your eyes adapt and moving about isn’t that hard. 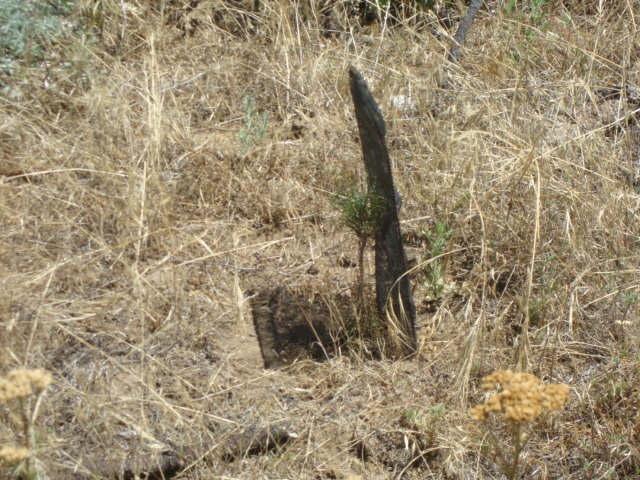 We picked up the pace and found a site about 100 ft. off the trail in a meadow full of gopher holes. We kicked into high gear gathering firewood, making a fire ring, and the myriad of other chores. The three of us working together were like a well oiled machine. Today was our longest hike and the blisters on my feet reminded me. Our bearcans served as stools around the campfire. Nightfall came swiftly and the wind blowing through the conifers made a sound like rushing water. The stars seemed more numerous tonight, maybe because the moon was behind the mountain. Drifting off into sleep, I dreamt that hundreds of gophers emerged from those holes in the meadow and dragged our backpacks down into the canyon. Bill Murray was right about those gophers in Caddyshack…. Next: Where’s the hiker shuttle?